Let’s begin at the beginning – what is an Indian trade blanket? Indian trade blankets are commercially woven wool blankets with striking geometric patterns. Trade blankets have long been an integral part of Native American culture. They’re used for clothing, bedding, warmth, ceremonial dances and gifts for important occasions. The original Indian trade blankets were the multi-striped point blankets imported by the Hudson’s Bay Company from English woolen mills. From 1780 to 1890 the point blanket was a staple in every fur trader’s inventory and thousands upon thousands found their way into indigenous hands. However, another weaving tradition began in the 18th century. The Navajo tribe of the American Southwest wove sheep’s wool into classic wearing blankets that became coveted trade items. When the Indian Wars ended in 1890 the reservation system began. With all the tribes now wards of the United States government, federally licensed Indian trading posts were established. The Indian traders promptly invented a new textile – the Navajo rug. It was a much heavier textile than the traditional Navajo wearing blanket and designed specifically for the floors of non-Indian homes. The designs were based on the Oriental rugs popular in the eastern United States. From that time forward the Navajo ceased making wearing blankets and wove only rugs for sale through the white traders. With the Navajos now exclusively weaving rugs, commercial woolen mill operators saw an opportunity to sell their machine-made blankets to the Indians and the result was Indians selling rugs to whites and whites selling Indian blankets to Native Americans – a practice that continues to this day. For over a hundred and ten years Indian blankets have been made for Indians, not by them! Indian trade blankets are often referred to generically as Pendleton blankets. While Pendleton is the only pioneer Indian blanket manufacturer still in existence, there were many companies that made Indian blankets. J. Capps & Sons – Jacksonville, Illinois – They were the first mill to produce Indian trade blankets – sending out their first samples on June 17, 1892. They manufactured under the J. Capps & Sons label and also as the American Indian Blanket Mills. Capps blankets are often quite simple in design, but elegant in their simplicity. They were extremely well woven and highly collectible. 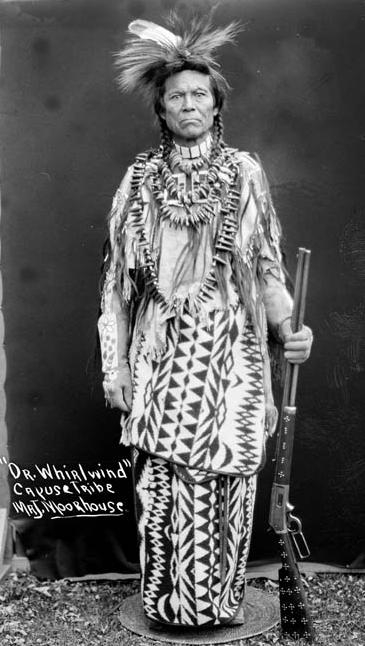 Capps ceased Indian blanket production by 1917. Buell Manufacturing Company – St. Joseph, Missouri – Buell made the most faithful copies of true Indian designs and stopped producing after 1911. Buells have always been extremely difficult to obtain. Racine Woolen Mills – Racine, Wisconsin – Racine made remarkably beautiful blankets and marketed them as the Badger State line. They specialized in fancy Indian shawls – in other words, fringed blankets. Trade blanket manufacturers refer to fringed blankets as shawls and non-fringed blankets as robes. Racine ceased production in 1912, but continued in business selling blankets manufactured by other mills. Shuler & Benninghofen Woolen Mill – Hamilton, Ohio – S & B’s Hamilton Blankets line shared designs with Racine and issued a nearly identical catalog in 1911. When is a Racine not a Racine? – when it’s a Hamilton! Oregon City Woolen Mills – Oregon City, Oregon – Oregon City made some of the wildest patterns of all and produced from approximately 1905 until 1935. Their line of novelty pictorial blankets – the Let ‘Er Buck, Totem Pole and Happy Hunting Ground blankets are highly prized by many collectors and fetch high prices. Knight Woolen Mills – Provo, Utah – Organized originally as the Provo Woolen Mills by Brigham Young, the company was later bought by mining tycoon Jesse Knight and manufactured excellent Indian blankets which they called Provo Robes. Exact dates of production are unknown, but 1915-1920 is likely. Extremely rare. Pendleton Woolen Mills – Pendleton, Oregon – Their first Indian blanket rolled off the looms in 1896 and they’re still at it! Hundreds of patterns have emerged from the Pendleton factory over the years including the enduring Harding and Chief Joseph patterns. 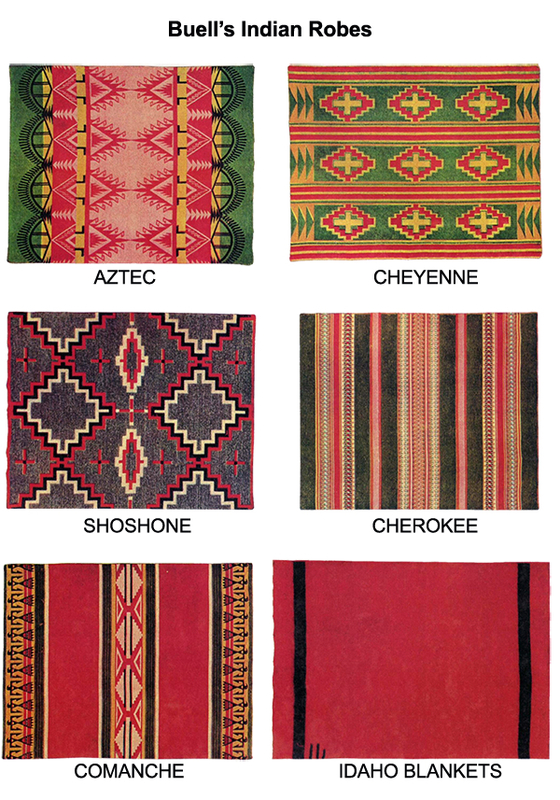 Over the years Pendleton’s primary Indian blanket lines have been Pendleton, Beaver State, Cayuse and Blackfoot. The latter two were budget labels and used remanufactured wool as opposed to the virgin wool used in the Pendleton and Beaver State lines. ONLY the Beaver State line of Indian blankets has been made in the modern era. INSTANT EXPERT TIP: Pendleton blankets with round corners like the magnificent backgammon pattern example pictured on this page were made between 1896 and 1908. All Pendletons made after 1908 have square corners. HOW OLD DO TRADE BLANKETS HAVE TO BE? Serious vintage blanket collectors seek pre-1942 blankets. In 1942 all mills were converted to war use and no Indian blankets were made for the duration of the hostilities. 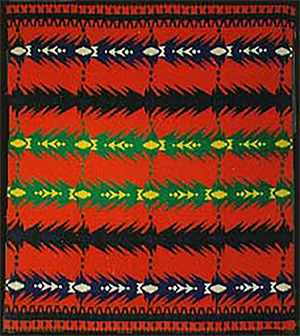 Pendleton began producing Indian blankets again in 1947 but drastically reduced the numbers of patterns they produced. ARE THE BLANKETS PEOPLE COLLECT FORMERLY OWNED BY INDIANS? Probably not. The blanket companies began selling to non-Indians almost immediately and it is primarily these blankets that survive. Indians tended to use their blankets until there was virtually nothing left to use. Also, many Indians used blankets as burial robes and some tribes continue this practice today. Pawned blankets currently offered for sale by traders near the reservations are rarely older than the 1990’s. While certainly some wonderful early trade blankets remain with Indian families they almost never find their way to the market. WHAT ARE THE MOST DESIRABLE COLORS? Advanced collectors value primary colors the highest – with red and black combinations the most desirable. The mills made more predominately brown blankets than any other color and while certainly collectible, these earthtones along with pastels almost always bring less money than reds, blacks, blues and deep greens. ARE ALL INDIAN TRADE BLANKETS WOOL? In a word, yes. Cotton blankets were never bought by Indians. This is an area open to individual taste. I prefer my blankets in mint unused condition, but many quite astute collectors (a certain Mr. Lauren comes to mind) prefer blankets that show years of very hard use. WHO EXPERTLY REPAIRS DAMAGED BLANKETS? HOW DO I DATE BLANKETS? If a blanket has retained its label dating is quite simple. All the mills I’ve listed above were with the exception of Pendleton quit business long before 1942, so if you see their label you’ve found a vintage blanket . Since Pendleton blankets are still being produced they can be quite tricky for the uninitiated. I advise the following: if the blanket’s label says “Guaranteed To Be A Pendleton”; “Warranted To Be A Pendleton”; “Cayuse Indian Blanket” or “Blackfoot Robe”, it’s a pre-1942 blanket. It is Pendleton’s Beaver State line that presents a problem to vintage blanket collectors. All Pendleton Indian blankets have carried the Beaver State label for a very long time and still do so today. There have been four different Beaver State labels over the years. 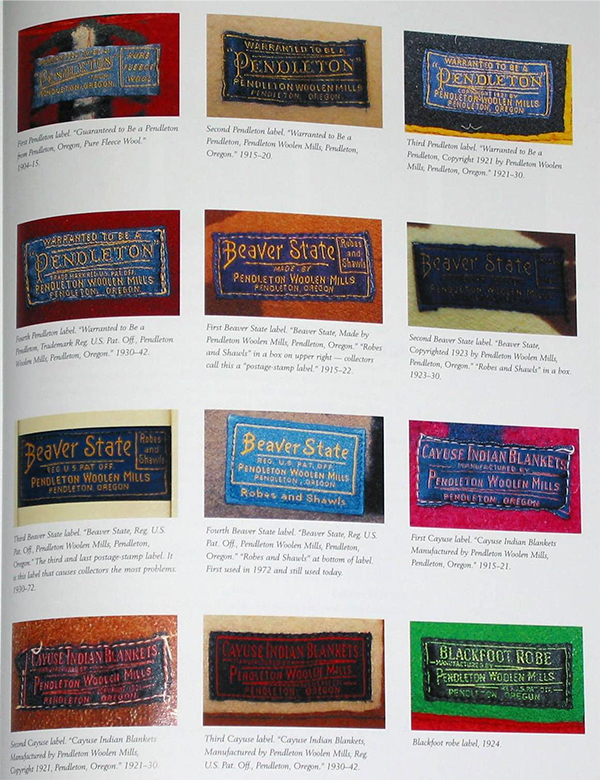 I recommend beginning collectors only buy Beaver State blankets that either have the words “Made By Pendleton Woolen Mills” or “Copyright 1923” on their labels to guarantee the blanket is pre-1942. The third Beaver State label was used as early as 1932 but continued in use until 1972 so it’s the world’s most dangerous label – it has the words Robes and Shawls within a box in the right hand corner of the label AND the words REG. U.S. PAT. OFF. in the label’s center. Post-1972 Beaver State blankets have the words Robes and Shawls on the bottom of the label. If a blanket doesn’t have a label (and a great many don’t) you must rely on your own experience, my book or the advice of an expert (preferably me). WHY WOULD I COLLECT MACHINE-MADE INDIAN TRADE BLANKETS RATHER THAN HANDMADE NAVAJO WEAVINGS? It’s not a case of either/or. I give you my permission to love both! The two types of textiles mix beautifully. Trade blankets are old, brilliantly colored, feature remarkable designs, are eminently affordable and Indians themselves loved them enough to buy them by the hundreds of thousands. Chief Joseph and Geronimo owned them – you should, too. Besides, if you collect Indian blankets seriously you will eventually meet me and I’m a legend in my own lunchtime.